Joy Rainey, who has a storied history in automotive distance runs in both current and classic machines, began a 2,826 mile trip across the U.S.A. today in a 1904 Oldsmobile. The first production horseless carriage was the Oldsmobile Curved Dash in 1901. In 1907, when production ceased, there had been over 19,000 made in various model variances. Today, the Joy Across America tour began as motor sports driver Joy Rainey and her team left Oceanside, California in a cross-country drive that will raise funds for the Cancer Research UK foundation. The car is a 1904 Oldsmobile Model 6C Curved Dash Runabout - built a year before the company was known as "Oldsmobile" - a mashup of the actual company name, Olds Motor Vehicle Company, with the cars cited as "Olds Automobile" in the press - becoming Oldsmobile in 1905 after the song "In My Merry Oldsmobile" was popularized. This 1904 model introduced rear wheel brakes and had a massive (for the time) 7 horsepower of output - 2 horsepower than the 1903 model. 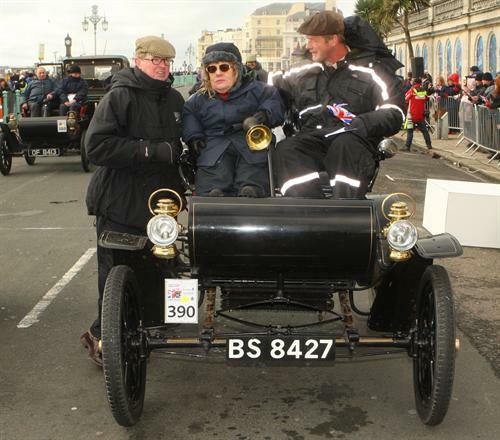 This specific car has already participated in long-range classic vehicle drives, including a London to Brighton Veteran Car Run in 2006 and 2007. Since that run, it has been rebuilt for its return to the U.S. and this historic trip spanning more than 2,800 miles. The driver of the car is as classic as the car itself, Joy having participated in just about every motor sport imaginable. From speed hill-climbing to circuit racing and long distance rally driving, she's been there. In the 1980s and 1990s, she was Queen of the Hill Climb in Britain in her Cosworth-Murrain Sports Racing car and Pilbeam-Heart. At vintage runs, she would use a 1936 Alfa Romeo. In 2004, she ran the 10,000 mile London to Sydney Marathon in a 1970 Morris Minor with her partner Trevor Hulk. In 2006, before running the Brighton VCR, she piloted a Jeep Grand Cherokee 4x4 in the Carrera Sudamericana - a 6,000 mile marathon through South America. In 2008, she and Trevor did the Indian Karma Enduro in a Hindustan Ambassador to raise money for charity. Today, Joy sets off from Oceanside (at the Pacific) on a U.S. coast-to-coast drive across America. Her first stint is to Julian, California (62 miles) followed by a drive to Brawley, California (75 miles) and then Quartzsite, Arizona (110 miles) followed by Phoenix (130 miles - the longest single leg of her journey). She will run through California, Arizona, New Mexico, Texas, Louisiana, Mississippi, and Florida. Her final destination is Daytona Beach and the Atlantic Ocean. If you can imagine, she will be doing all of this in a car that has a top speed of less than 25 miles per hour and which will slow down to a crawl going uphill. As the Joy Across America site says, "..the travellers[sic] will not only be able to enjoy the scenery, but at that speed possibly smell the flowers and hear the birds sing, as they merrily chug along. The original route followed the first cross-country run, done in 1903 by Whitman and Hammond, but that northern route is no longer suitable for a slow-moving, 109-year-old car as much of it is now freeway where the car is not allowed. Nevertheless, the route will be challenging as it is and will take the car and driver through desert, high mountains, small towns and big cities. Below is video of what it's like to sit in the 1904 Olds and putter along the English countryside.